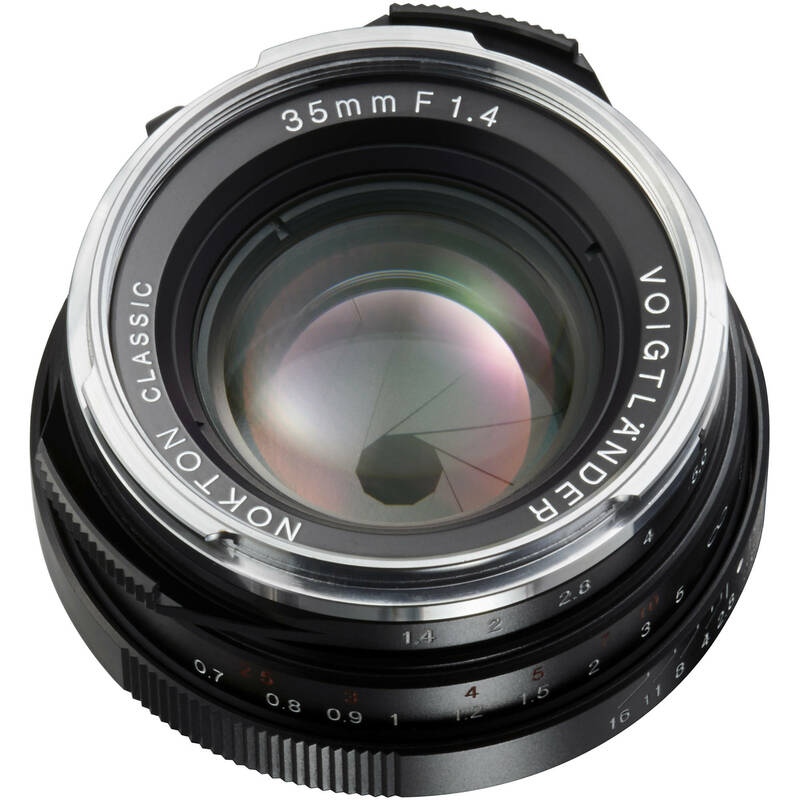 Blending a compact form factor with versatile performance, the Nokton Classic 35mm f/1.4 MC from Voigtlander is a fast wide-angle prime designed for M-mount rangefinder cameras. Using a symmetrical optical design, along with high refractive index glass, distortion and spherical aberrations are controlled in order to realize a high degree of sharpness, clarity, and even illumination. This lens also features a multi-coating to suppress lens flare and ghosting for improved contrast and color fidelity when working in strong lighting conditions. Its manual focus design permits working with subjects as close as 2.3' away and a 10-blade diaphragm contributes to a pleasing bokeh quality to suit working with shallow depth of field. Fast f/1.4 maximum aperture helps control depth of field for shallow depth of field shooting, and also benefits working in difficult lighting conditions. A symmetrical optical design, along with high refractive index glass, is used to reduce distortion and spherical aberrations for improved clarity, sharpness, and even illumination. This multi-coated version of the Nokton Classic 35mm f/1.4 produces vivid yet accurate colors along with high contrast and saturation, making it well-suited for general shooting applications. Manual focus design enables a minimum focusing distance of 2.3'. A 10-blade diaphragm contributes to a smooth and pleasing bokeh quality. Compatible with optional LH-6 lens hood. Nokton Classic 35mm f/1.4 MC Lens is rated 4.3 out of 5 by 33. Rated 3 out of 5 by chennome from good lens for the price I've been using a Leica M8 for some years. The 35mm so far is my favorite for street fotography. I was excited about this very fast lens for the price. So decided to give it a chance. It's very well built, durable, nice bokeh, not as sharp as a Leica or Zeiss. But the thing that bothers me is the magenta aberration more than usual. All photos taken with a background source of light look as they have a silky magenta layer on, which is understandable because of the lack of an ir filter of the m8. But it looks worse then any other lens I used. But if you're keen to shoot monochrome photos. This accessible lens + m8 would be good friends. Rated 4 out of 5 by Stephen from Better than pre-ASPH Leitz but 1/4 price I did not expect this Nokton to be so sharp. Overall image quality seems to be sharper than that of pre-ASPH Summilux Leica. Pros: sharp image quality; very light; holds against flare very well. Cons: bokeh not as beautiful compared to Summilux 35. Conclusion: Nokton 35mm f/1.4 is a unique lens in the market. It is fast, sharp, but still very cheap. I think Voigtlander is doing great job in lens production, as well as positioning their products against competitors. Rated 5 out of 5 by Jef the guy from Great all-arounder for the Leica M8 I was used to having a 50mm lens on my K1000 so was looking for something equivalent to use with the Leica M8 i just bought. I had sticker shock when i started looking at the lenses available. (the M8 was cheap on an auction site) So i started looking at Zeiss and Voigtlander as possibly good entries into the Leica world. After checking out Flickr shots using this lens it seemed to be be a really good performer so i dove in for 1/7th the price of an equivalent Leica-branded version. I have taken beautiful hand-held photos in the dead of night, and full-on winter sunshine in the snow and have yet to find a fault with the lens. You don't have to mess around with frame lines in the viewfinder since the default ones match the 35mm, it is bayonet-mount so you don't need an adapter, and it is crazy fast, making it a lens you could probably glue to the M8 body. Buy this lens! It is really compact, beautifully made, shoots beautiful photos, and is cheap in the world of Leica. I don't see any other lens offered by B+H that offers the versatility and value that this 35mm Voigtlander does, for the M8. Rated 5 out of 5 by Mark from Incredible value for the money This lens is sharp, renders colors well (with an IR cut filter on the M8), is small and light and smooth in operation. What more could one ask for? How about an astonishingly low price...especially when compared to comparable Leica lenses. Highly recommended. Rated 5 out of 5 by Anonymous from Great lens for Leica on the cheap. Great lens for the money. I am more of a 50mm guy and own a Leica 50mm and a 90mm lens. I did not want to spend a lot on a focal length I just mess around with. I have been using the 35mm now for a year or so and like it a lot. Great for street photography and it is very small and built like a tank. Rated 5 out of 5 by thirdborn from excellent lens i bought this lens for my M8 and love it. i wanted a lens that would get me as close to 50mm as possible and this one does the trick. i am also so impressed with the fact that it takes in so much light. i took a three second shutter in low light with out a tripod and it looked great, and in focus. part great camera part great lens. only down side is finding filters for it but i shoot 100% b&w with this camera so filters won't be needed. also hats off to the team at B&H. i have bought a number of items from them and will continue to do so. i live on vancouver island in canada and there is nothing around here that matches them. Rated 4 out of 5 by dmstraton from Nice old school lens I use this on a Bessa, mostly for street photography. Love the creamy dreamy rendering wide open and it is sharp stopped-down. Great build quality. Fun to use. Haven't used on digital so can't comment. Is it just me or do these old-style lens just look and feel better than modern lenses, which are big and cheap looking? One thing I have found is that AF is over-rated on anything 35mm or less - I don't find speed of focus to be an issue - but I suppose it is a matter of skill and experience. Nice lens in my favorite focal length. Yes, you can use a lens adapter to mount Leica M mount lenses on Olympus micro four thirds cameras. Hello, I am planning on buying one of this lenses.But I would like to know the difference between this one the Nokton Classic 35mm f/1.4 Manual Focus M Mount Lens - Black by VoigtlanderAnd the: Voigtlander Nokton 35mm f/1.4 Lens (Single Coated)They are both the same price, I just can't tell the difference.Thank you for your help. I've read somewhere that if you plan to shoot mostly B/W images then the single coat is the way to go. How does Leica M meter with this lens? also what if we use a Sony A6000, how will the metering be? Which Leica M? The a6000 has different metering modes from matrix to spot metering. The lens won't change how the camera meters the scene. what adapter would you need for a nikon F mount? Unfortunately, we do not carry a lens adapter that is designed to allow you to connect the Voigtlander Nokton Classic 35mm f/1.4 MC Lens to the Nikon F-mount lens mount. hello I want to buy this lens for Leica T camera. what kind of adapter do we have to buy? You can use a Leica M to Leica SL/T adapter. Is this the multi- or single coated version? Do I need and adapter if I have a Sony A7? Will this lens work with focus peaking on the Sony A7rii? Asked by: Pedro Henrique G.